This Christmas I got Tales from Pigeon Inlet, a set of CD's with 30 of the stories that Ted Russell told on the Fisherman's Broadcast in the 1950's. I remember liking reruns of the stories when I was a young teenager, but hadn't heard them for a long time. Since I got this collection, I have gone through the entire series of stories probably 10-15 times. I keep thinking that I will get bored, but once one of the stories starts, and Uncle Mose starts talking about Aunt Sophie or Grandpa Wallcott, it seems rude to bother him, and once again I am drawn into the life of these people who I recognise in my own parents and grandparents. There are many reasons to love these stories. Ted Russell is a master storyteller with real empathy and love of the character he plays, and of the other people in this place on the Northeast Coast. His style is engaging, and you enjoy the way he tells a story as much or more than the story itself. His natural humour, the way he brings out each character with sympathy and humour, and his very expressions and accent make you feel like you are in the sail-loft with the other fisherman, listening to an old and respected friend. He grew up near the end of the era of outport life in the early 20th century, and he was trying to preserve what the life was like, and how the Newfoundlanders who experienced it were able to cope, and to bring an amazing community spirit and a sense of humour to a life that is beyond the experience of most Newfoundlanders living today. He shows them as real people with real faults who still managed to live and thrive together, and to respect at least some aspects of their neighbors (Stealin' the Holes). 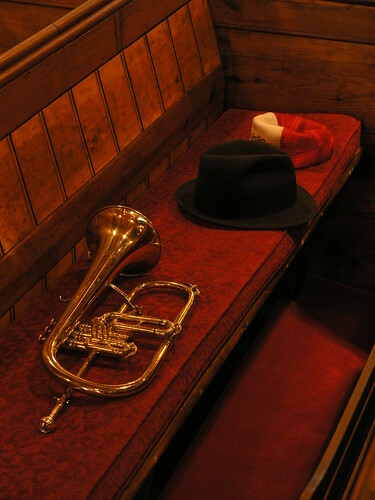 The stories show in hard times people would share and struggle together, and how it was assumed to be the natural course of life and not something to be commented on as something special (The Bull Moose). The characters are amazing. Grandpa Wallcott is the sage who tells sly stories that gently poke fun of those who take themselves too seriously (Arguments), and who is in turn prevented from becoming to big for his britches by his wife Liz (Alcoholic Liquor) . Skipper Bob Killick is the magistrate who knows little of the law, but what he doesn't know he makes up for in his understanding of people (Beery Juice and Stealin' the Holes), and in his ability to come to verdicts and sentences that are fair and consider the sensibilities and the characters of all involved. Aunt Sophie keeps Uncle Mose on his toes and makes him work for his comfortable bachelorhood (Drama Festivals). In his stories Russell covers three generations of people and over 50 years of history, from the late 1800's through the Great Depression (Tobacco & Hardtack), the World Wars, and though to the beginnings of adjustment to both Confederation (John Cabot) and to Newfoundland opening up to the rest of the world (Jonah & the Whale). He shows how different people felt about such things as Confederation without forcing his own view (The Hockey Game and Dictionaries). In several of the stories he deals with how outport people understood and reacted to the changing world around them. While uneducated in modern ways and viewpoints, he portrays them as wise even in thier misconceptions about the outer world. In fact, he sometimes shows where the viewpoint of the outporters has more value than that of Canada and the "Modern" world. Finally, he wanted to make sure that all people in Newfoundland would be able to understand each other in the future, that they would be able to know the difference between a "mug up" and a "scoff". He even suggested that the new university should make a dictionary of such words, so that young people would understand their elders (:-). In his stories he has done the same in a much more fun and memorable way. His stories tell things about the people and the outport life of our forebears that cannot be captured by any dry history, and that transcends the fiction of the Tales to the truth of their lives and values. Hopefully our generation and future generations will never forget and will learn from them. I'll probably wear the poor CDs out, and I look forward to anything else that may be recovered from the 600+ stories and tales that he learned and transformed into magic as Uncle Mose. Trap Skiff: These were developed for the inshore fishery in the late 19th century after the development of cod traps. They were initially under sail, but quickly switched over to engines, mainly "make and break" two-stroke gasoline engines. I can remember the sound of these engines as the boats would leave the harbour. 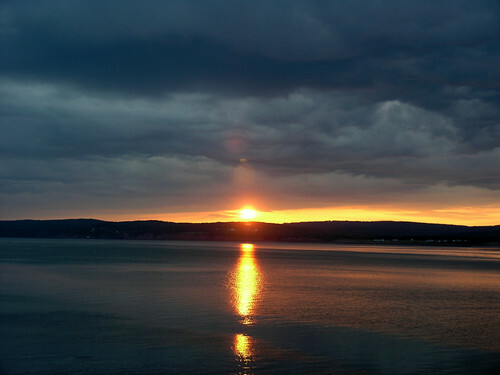 It was a quiet and mild put-put-put….that drifted across the water. They were still being used in some of the boats in the late 1960's, although many were switching to diesels (actually they didn't sound that different). 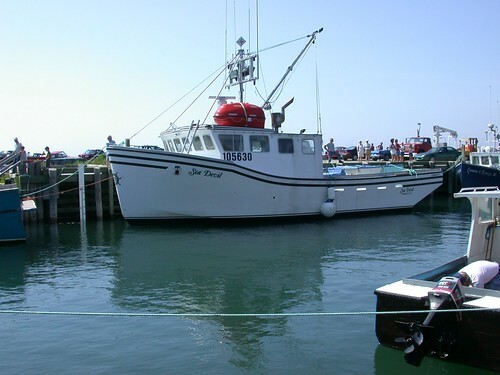 My dad was a mechanic and would help people in Petty Harbour, Bay Bulls and down to Cape Broyle, usually in exchange for fish or a returned favour. Rodney: my favourite small open boat. Ususally less than 14 feet long. They used to be common on the Southern Shore. They were all-purpose small boats, and often helped the trap skiffs when hauling the traps. Gander River Boat: really long and narrow, and unique. In an idle moment last night I tried to come up with a few ships of significance (both to us or to the rest of the world) related to my home province. A surprising (to me) number came to mind. This is a list of some of the ones I remember, as well as those suggested by friends. If anyone else remembers any ships that should be included, drop a line. Basque whaler in Red Bay, Labrador, (1565? ), which may be the San Juan. Happy Adventure: The pirate admiral Peter Easton’s flagship. Great Eastern: When commissioned in 1858, it was the largest ship in the world, and remained so for about half a century. In 1866 this ship landed the first transatlantic cable from Valentia, Ireland at Heart’s Content. This tiny community eventually became one of the main communication hubs between Europe and North America, and remained so into the twentieth century. The Brendan (Tim Severin, 1976-77). I was in grade nine at the time, and we followed her saga as she came across in some fairly dirty weather. But she made it, landing at Peckford Island in Newfoundland, showing that the voyage was possible (and no, Brian wasn’t in office at the time!). One must remember that Irish monks were regularly sailing to Iceland and had settlements there, and were supposedly good mariners of the day. She is currently in Craggaunowen, County Shannon, Ireland. Matthew, a navicula of about 50 tonnes. I had the pleasure of being in Conception Bay in a wooden sailing dinghy when she came into the bay before docking in Long Pond. We had a nice conversation with the crew as they drifted in, some of whom were Newfoundlanders. The dinghy was faster than the Matthew, by the way. I was also in the Narrows of St. John’s as she sailed in to much applause and hoopla. She is currently based out of Bristol, England. Greenland Disaster: A sealing steamer. 48 men from her died on the ice in 1898 when a major storm blew in. The ice closed up and prevented the Greenland from closing on the sealers on the ice, while at the same time an interior lead of water kept the sealers from approaching the ship. There was also some discussion of the behaviour of Captain Abram Kean, who was in the area commanding another sealing vessel. Kean later became infamous for his role in the Newfoundland Disaster sixteen years later. Newfoundland Disaster: The sealing disaster in March, 1914 where 78 sealers died and 11 were permanently disabled. It is poignantly described in Cassie Brown’s Death on the Ice. Southern Cross Disaster: This is the one that many people (including myself) forget. She was lost with all hands in the Gulf of St. Lawrence during the same storm that caught the sealers from the Newfoundland on the ice at night. She was last sighted by the SS Portia near Cape Pine, and was never seen again. This counts as the single largest loss of life in the history of the seal hunt, with 173 souls being lost. Combined with the 78 deaths from the Newfoundland, at least 251 people died from the same storm. If you compare that to the casualties from Beaumont Hamel, it adds a new perspective to the dangers involved in sealing. On July 1, 1916, the Royal Newfoundland Regiment bravely attempted a frontal assault on the German front in what is considered the worst military disaster in the history of Newfoundland. 255 were killed, 386 were wounded, and 91 were listed as missing in action and presumed dead. Viking Disaster: A sealing disaster in 1931, when the Viking (a wooden ship built in 1881), exploded while shooting footage for the sealing film The Viking . Film producer Varrick Frissel and 26 others died in the explosion. A number of sealers made it to Horse Islands. However, there were insufficient supplies, shelter or medical equipment to keep the men alive for long. Rescue ships, including the salvage tug Foundation Franklin and the Reid coastal steamer Sagona took on supplies and medical personnel and raced to the area. However they were delayed both by a raging gale and by the ice, which had driven in around the island. Here is a transcript of documents from the time of the disaster. This was the first, but by no means the last, time Newfoundland and Newfoundlanders were involved with the Franklin. Caribou Disaster: One of the most famous of the ferries running between Newfoundland and Canada. It was torpedoed by U-boat U-69 on October 14, 1942, during the critical period of the Battle of the Atlantic. 147 passengers and crew lost their lives. The skipper Ben Taverner and his two sons went down with the ship. The coastal boat Taverner was named after him. Foundation Franklin: Immortalised in Farley Mowat’s The Grey Seas Under. A British built World War I salvage tug, originally named HMS Frisky, bought by the Canadian company Foundation Maritime, and in service in Canada and Newfoundland from 1930-1948. During that time she rescued hundreds of ships, and some of her rescues would curl your toes. Many Newfoundlanders crewed on her, and two of her best skippers were Captain Irwin Power and Captain Brushett. She earned such a good reputation that the U.S. Navy gave her priority of command in any salvage operation with American warships. I confess that she is one of my favourite ships of all time, and her crew performed many harrowing and heroic acts. She is a classic iron ship with iron men. HMS Prince of Wales and USS Augusta: Churchill and Roosevelt met in Placentia Bay to sign the Atlantic Charter. This was considered to be one of the first steps towards the establishment of the United Nations. Coastal boat and part of the Reid Alphabet Fleet (the ships were named in alphabetical order for places in Scotland, Reid’s homeland). Famous for many things, including ship rescues, trips to “the Labrador”, and one aviation incident. She is most famous for Ted Russell’s “The Smokeroom on the Kyle“, one of his tales from Pigeon Inlet. William Carson: An Icebreaking passenger/car ferry. Commissioned in 1955, it was a huge ferry for its time. For the first two years it couldn’t dock at Port aux Basques, and used Argentia until docking facilities were expanded. In 1977 she was struck by a small Iceberg near Battle Harbour, Labrador, and sank with no hands aboard (no one died). Joan Morrissey wrote a fairly funny song about he Carson and its usefulness to the province. Happy Adventure (Itzatzozale Alai): A Southern Shore Bummer or Jackboat bought by Farley Mowat and described in “colourful” detail in The Boat Who Wouldn’t Float. She was basically a 30 foot schooner with a two-stroke gasoline “make and break” engine (mostly broke); the engine had the interesting feature of starting in either forward or reverse 50% of the time. She also had the ability to always know her birthplace; if you sailed her away from the Southern Shore she would try to sink, and she was very determined about it. Somehow Mowat and others, including Mike Donovan the librarian, managed to survive a trip to St. Pierre, where she became a “flagship” of the renascent Basque seagoing tradition, and a year later they made it to Burgeo, where they stuck for a number of years. Finally, in 1967, they were in bad odor in Burgeo, so Mowat managed to sail her all the way to Expo in Montreal, where she promptly sank in the main marina. They don’t make then like that anymore! Ocean Ranger: At the time the largest semi-submersible oil rig in the world. In February 1982 she sank with all hands. The supply vessel Seaforth Highlander was almost able to rescue some, but they failed be mere feet. As a result of this disaster the offshore oil industry has been changed, with changes in rig design, operational procedures, safety equipment, and extensive emergency and lifeboat training. CCGS Ann Harvey: In 1828, Ann of Isle aux Morts, her father, and the Newfoundland Dog named Hairy Dog saved about 160-170 Irish immigrants from the wreck of the brig Despatch. For the rescue Ann was given 100 pounds and a Gold Medal by the Governor of Newfoundland. In 1938, she and her father also saved a number of people from the Rankin, wrecked at the same spot as the Despatch. 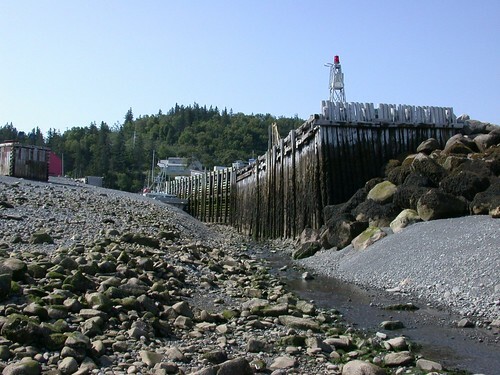 Isle aux Morts was so dangerous to shipping that throughout her life she and the other settlers were burying bodies that washed ashore.In 1987, the Canadian Coast Guard vessel Ann Harvey was commisioned. HMS Sapphire (9/11, 1696): Trapped in Bay Bulls Harbour by a French attacking force, she was scuttled to prevent capture. 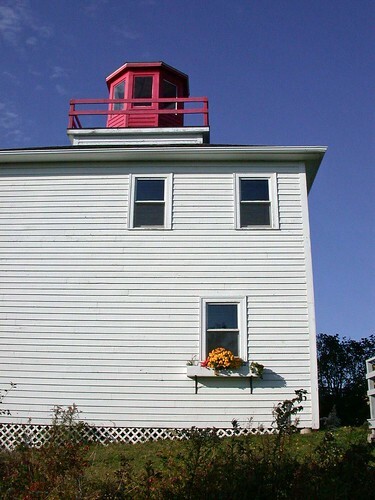 She is a Provincial Historic Site and has produced much archaeological insight into naval life of the times. This was also one of the main periods of French-English conflict in Newfoundland. Waterwitch (1875): Wrecked near Pouch Cove. When the ship went aground in a storm with 25 people on board, Alfred Moores, a resident, performed a daring rescue which saved 11 people. He allowed himself to be lowered to the ship by a rope from an overhanging cliff so that he could carry the people to safety. Florizel (1918): the well-known steamer owned by the Bowring Brothers Ltd. went aground at Horn Head near Cappahayden on the Southern Shore of Newfoundland . The SOS was received at the Admiralty wireless station. Ninety-three crew and passengers perished, while 44 were miraculously rescued after 27 hours spent braving punishing seas and bitter cold. Bell Island’s U-boat casualties (Saganaga,Lord Strathcona, P.L.M. 27, Rose Castle): these were bulk iron ore carriers sunk at or near Lance Cove on Bell Island in Conception Bay. 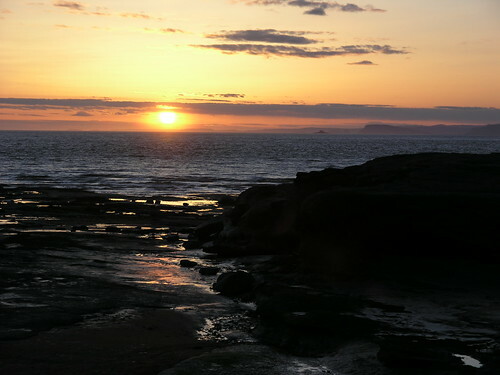 Bell Island has the distinction of being the site of the only artillery fired in defense of North America in the Second World War, due to these attacks. USS Truxton and Pollux: (much of this is a direct quote from SkylarkD, and this entry is due to her kind suggestion) These two U.S. Navy ships ran aground near St. Laurence, Newfoundland on February 18th, 1942. 203 sailors died; 185 were saved. Well, it turns out that there was only one African American survivor of the U.S.S. Truxton, named Lanier Philips, and he says that it was the hospitality he received from the people of Newfoundland after the disaster which led him to become a civil rights leader for equality for all races in the U.S. military. I grew up near St. John's, where I am taller than the range from low to high tide. Combine this with my fascination with the ocean, and the fact that I am currently posted within an hour's drive of some of the highest tides in the world. It would then be understandable that I would visit the area and see whether or not the tides actually go over my head. Lesson number one: Look at tide tables when planning a trip. Lesson number two: Looks at a map and figure out where the sun is going to be when you are there. Lesson number three: Check the weather, especially satellite pictures of clouds. I started with Hall's Harbour, where there is a nice little wharf where you can see the postcard pictures of boats on the bottom of the harbour. I thought it would be a bit boring, but when you can walk out of the harbour and continue "downhill" for over 300 metres, and you end up looking upwards at the base of the dock pilings, it really hits home. However, the scenery there is a rocky beach leading up to trees. 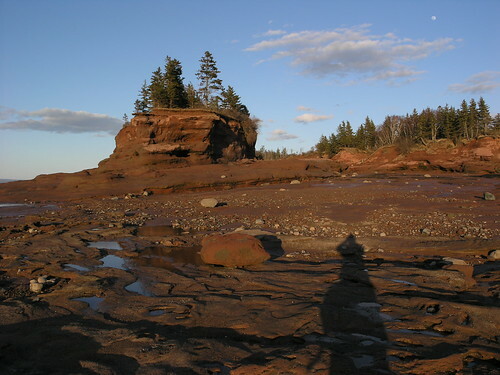 So after Hall's Harbour (which named after the pirate Sam Hall) I visited some areas within the Minas Basin, which is the part of Fundy with the highest tides. 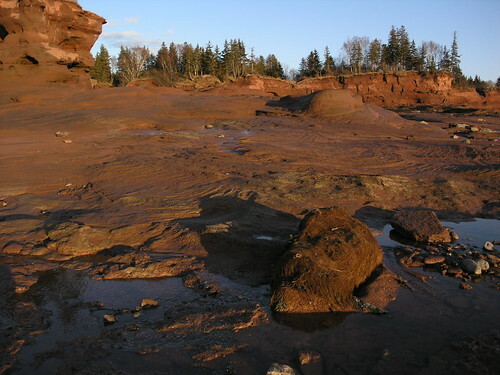 It is also surrounded by sedimentary geology, with a lot of reddish clays, sands, sandstones, siltstones, and a fair bit of mud. Combine this with extremely strong tidal currents and you have constantly changing scenery. 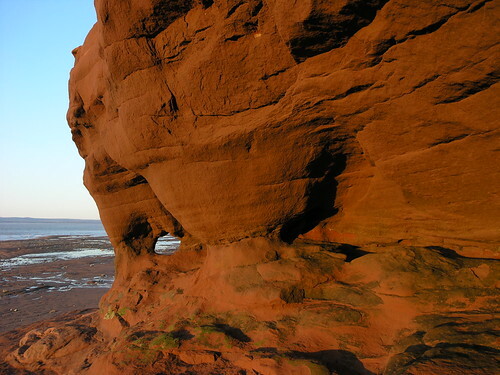 There's also extremely old fossils, especially on the north shore near Parrsboro and Five Islands Provincial Park. The scenery got a bit better. 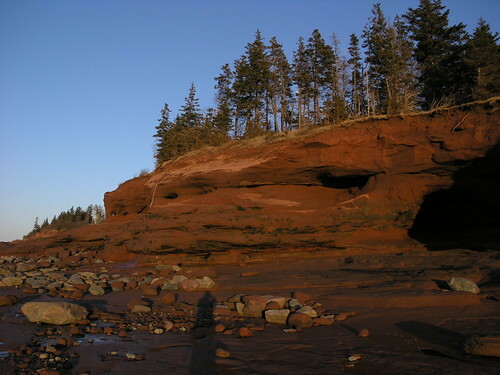 Red Head Trail from the beach: The white bad marks the boundary between the Triassic and Jurassic periods. 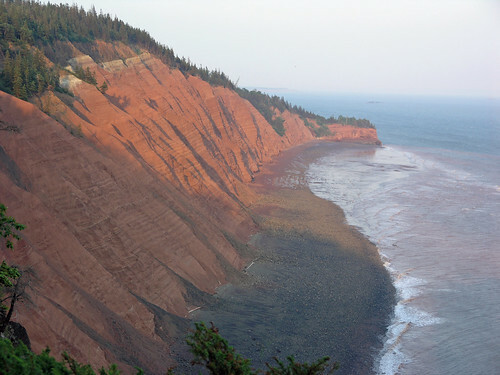 Then I went to Blomidon and the Provincial Park, and saw how far offshore the bottom could be exposed. 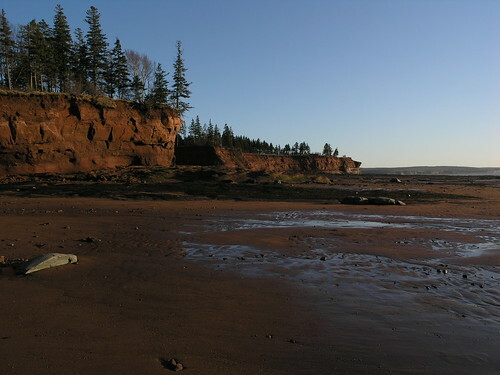 There are also sections near Parrsboro where the water goes out for 3-4 km at low tide. After all this, I thought the site with the world record tides would be anti-climactic. First, I had heard nothing about the scenery, so I assumed there wasn't much. Second, to appreciate the tidal range you really need a convenient vertical length scale, like the wharves at Hall's Harbour, and then it is necessary to be there at both the high and low tide times. Another thing that you quickly realise is that being there during high tide is often boring. Everything is underwater, and to you it is like any other picture of coastline. I've found that the best time to get there is at low tide, if you can't be there both times. At least you see how low it gets, and you can see high tide lines to get an idea of the range. 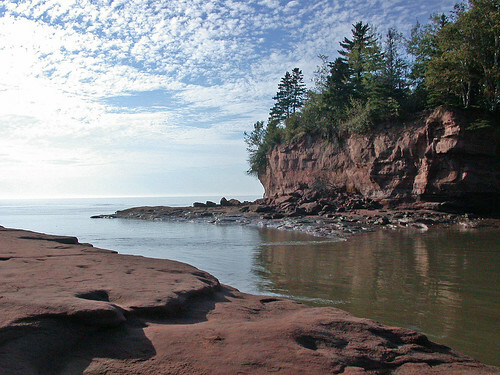 The first time I went was before I had learned much about Fundy, so I went near high tide to say I had seen the highest tides. It turned out that the site was nicer than I had thought. The Island just offshore: there is a ripple where the current is running out. So the scenery was very pleasant, and the little island offshore, and the plug of rock sticking out along the coast looked nice, and the colours looked nice, especially in the sun. I went back a number of times, including low tide, but it always turned out that the tide extremes were near mid-day when I was free to go. It was great looking around but the glaring sun washed out the red tones of the rock and soil. 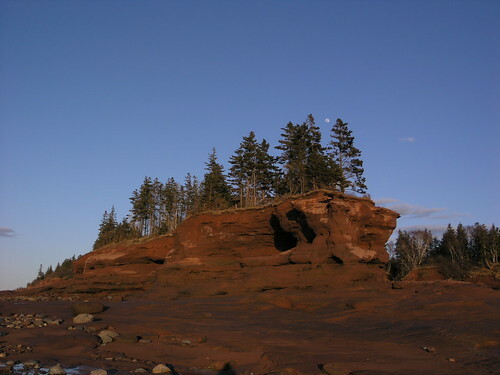 Some of the nicer things that happened included deer running from the island to shore when the tide went out, often being there when no one else was there, listening to the tidal current as the water drained from the strait between the shore and the island, and the total misty calmness of the Minas Basin. Finally, on Monday after work I scooted up to the Head. Low tide was 6:08 pm, and sundown was 8:08 pm. I got there at 6:45 pm and wandered around until sundown. Then I had to leave as they close the site at dusk. But the light was wonderful, I was alone, it was serene, and even the sunset was okay. The bottom here is mostly sandstones and sand, with very little clay and mud. Other areas have a different mix. When the tide is running you often see the water turn red. To the right is land and the park. The upper centre is an island near high tide. I'm below the island and about 200 metres from it. The normal tidal range here is about 15 metres or 50 feet. The record is 17.0 metres or 56 feet. 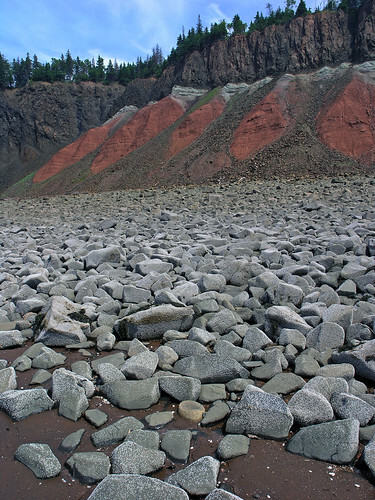 Leaf Basin in Ungava Bay, Quebec, is the only other site in the world with similar numbers. The Canadian Department of Fisheries and Oceans has determined that neither is clearly the winner, and they need to make measurements over an 18 year period to come to a definitive answer. 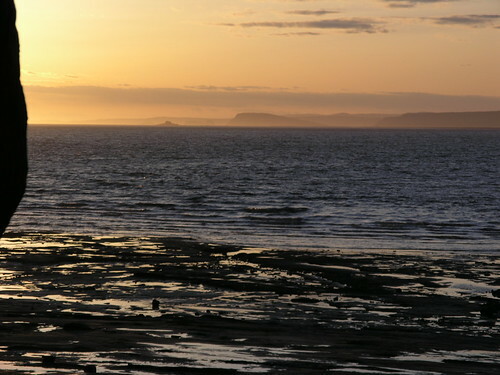 Since I couldn't get to Ungava Bay, and the scenery here is better, I settled for Nova Scotia and the Bay of Fundy. I guess I have an overactive imagination. Land side of the island about 30 minutes from high tide. Large tidal changes means strong bottom currents. Combine this with very soft sandstones, siltstones, and solidified mud, and you get an ever-evolving bottomscape. Guess how high the tides can get? Neither the rope nor the hole in the rock are visible from the shoreline in the park. 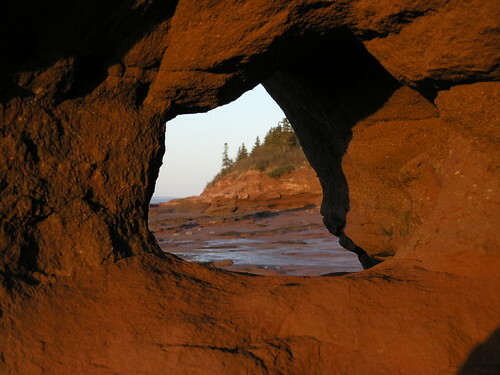 The rocks are becoming redder as the light is becoming less harsh. 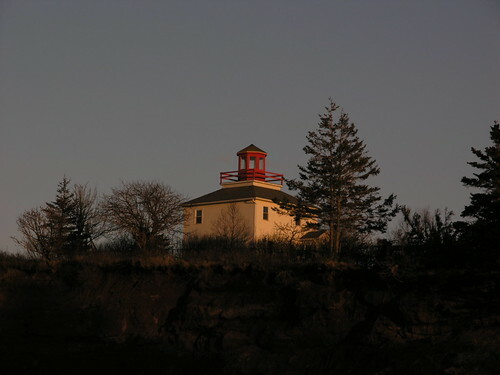 Burntcoat Head Lighthouse. During the day. 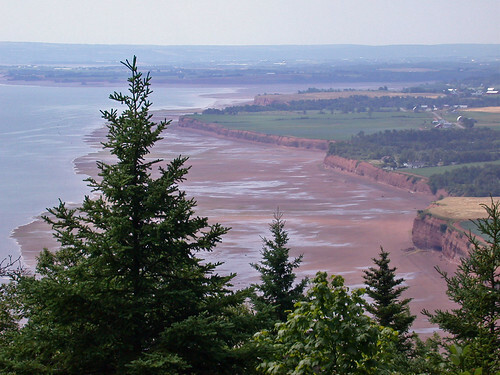 Just across the Minas Basin is Five Islands Provincial Park. For some reason the Basin is usually misty. I think it is due to cold water being tidally mixed to the surface, cooling the air until mist forms. 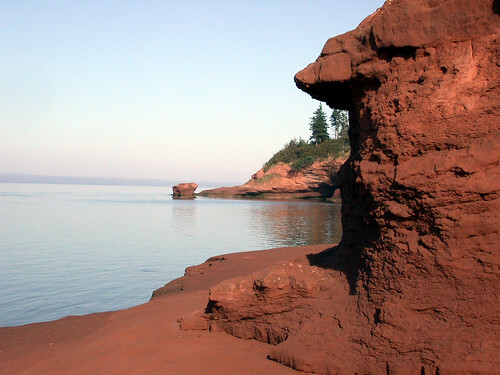 Legend credits Glooscap for creating the Five Islands in the Minas Basin. These were formed when he threw giant handfuls of mud at the disrespectful beaver who had built a large dam and flooded Glooscap's garden. 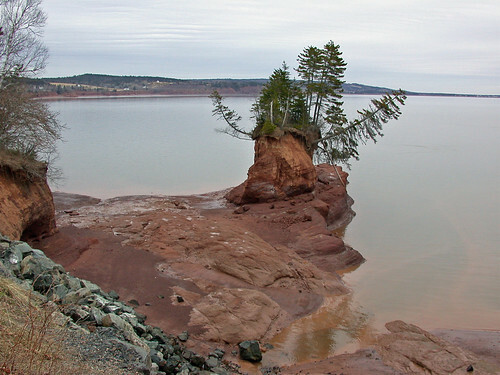 Glooscap smashed the beaver's dam and allowed the water to pour in, thus creating the Bay of Fundy tides. Tuesday night I attended a talk and slide show at a local museum about sea kayaking around parts of the Atlantic Provinces. This included the Baie Verte Peninsula and the Southwest Coast of Newfoundland. Spectacular scenery, the ocean, ice bergs, old and current outports, and lots of birds and sea life. That talk did good things for my soul. After the talk I started thinking seriously about how I could manage time on the water, both in the short and long terms. 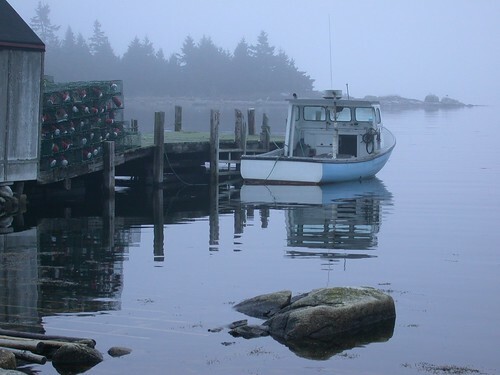 Ever since I have been young I've been in love with the ocean, and my dad used to help out the local fishermen with the engines of their boats on the Southern Shore. I've been out in kayaks, canoes, rowboats, Rodneys, trap skiffs, small motorcraft, the Bluenose II, a few Canadian destroyers in the Pacific, and some friends' yachts. Despite a bit of seasickness, being on the rolling swell makes you feel alive, and you can't sleep in a better place. Then there is the coast, as seen from the ocean. From the East Coast Trail you can often look down at sea stacks and sea caves, but imagine looking into the caves and kayaking into them, or looking up 100 metres to the top of a sea stack. 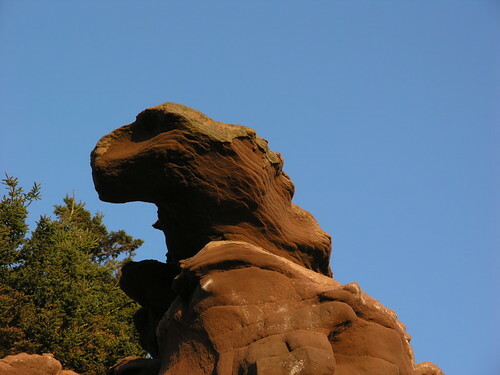 Or looking along the coast for a landmark, and seeing the Spout blowing with the sun behind it? I like hiking a lot, but coasting along and dropping into the shore and hiking into areas difficult or impossible from the land is really appealing. I need a boat! How to do it? Having helped out others with their sailing yachts, I know full well the amount of time, sweat, effort, and money that goes into them. Canoes, speedboats, Seadoos and other such toys have no real appeal to me. I want to go around the coast, be able to anchor or tie up, and finally be able to sleep on board. This sounds like a motor yacht, but again they do to money what the Sun does to hydrogen. 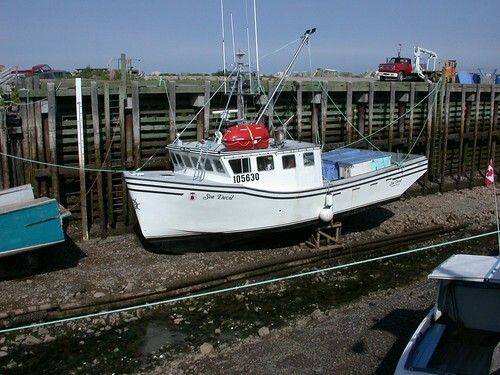 Maybe one of the smaller fishing boats around Newfoundland, with a cabin big enough for sleeping and with a tiny galley would be the answer. Many are rugged and seaworthy, easily maintained, and have unpretentious but practical accommodations. They eat fuel but they often have a good range, and you could add a seagoing kayak or two for exploring. I could see taking a couple of weeks to cruise from St. John's to Port aux Basques, with a lot of exploring mixed in, and taking friends on day trips down to Bay Bulls, with a picnic at one of the many safe harbours along the coast, and a little exploration thrown in. But first I have to finish my thesis then see what is in store for me after graduation. I may have to stay in Halifax, but I am keeping my ears open about Gander. All I ask is a small ship and a star to steer her by. 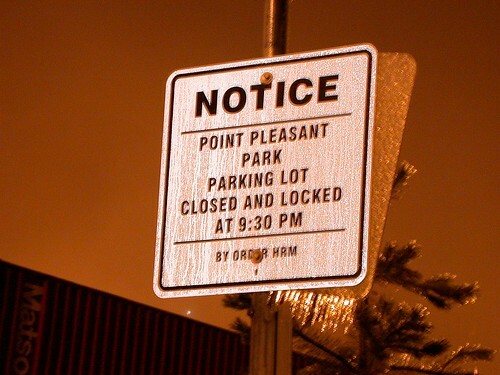 Freezing rain pictures to set the mood. 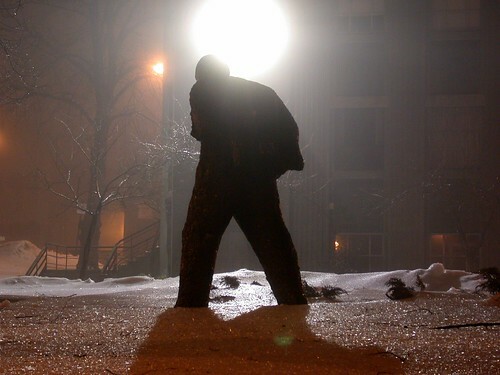 Churchill Walking into the Light. After 3-4 hours sleep I awoke at 6 am to get ready to work at the weather office. The shift is 12.25 hours, starting at 7 am, and today I was responsible for the Newfoundland and Labrador public and 5 day forecasts and the media messages for same. In case you don't know, one forecaster is responsible for the NL public forecast, one for the NS/NB/PEI public forecasts, one for the marine forecasts for the Maritimes and Newfoundland, one for the wave forecasts for all Atlantic Canadian waters, and in the spring one for the weather forecast used to help predict flooding along the St. John River in New Brunswick. Finally there is a supervisor responsible for checking all the forecasts and monitoring things, and for doing a few forecasts of his or her own. For those unaware of the geography involved, ALL the Maritime provinces combined have about the same land area as Newfoundland, and Newfoundland has 1/3 the land area of Labrador. The point here is that today I was forecasting for 80% of the area of the Atlantic Provinces. 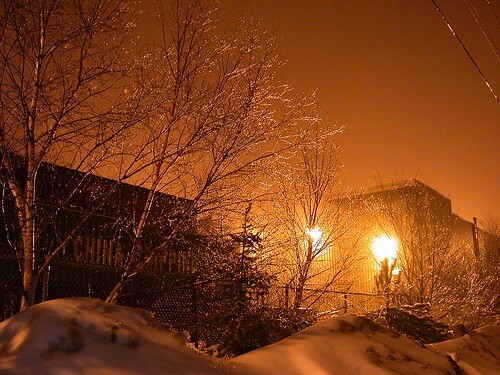 Baie Verte: Rain changing to snow, then to snow mixed with freezing rain, switching to flurries, then …. all based on one auto station that doesn't tell you what the precipitation type is and with a badly calibrated set of temperature measuring devices. The only other thing is a Dept. of Highways webcam with a dirty lens! Extended forecasts for both Labrador and Newfoundland out to five days. To make it more interesting, the entire cycle has to be done twice during a shift, add a forest fire forecast for the entire province, add media interviews on some days, and you can see it can get a little hectic. Finally, this was a day when no warnings had to be issued or monitored or updated every three hours or less. Also today I had to get a little admin work done because security in the building was being enhanced, so I now have a new key and a new badge with a picture of me with a sour expression. While things were going on today, Lee Titus, a friend from the old Gander office came down and asked for a little help with Matlab. He wanted to make a function that would locate any geographical point in our forecast region within its appropriate grid box in the weather model. I figured out a 6 line algorithm to do this and explained the idea to him and what functions he would need. He came back just as I'd finished the morning forecast with a problem (he'd forgotten to reference his map to a grid reference). Then while I was working on the afternoon forecast (we have one less hour to do this because of the time change and the fact that the computer model can't change to daylight saving time; data around the world is fed into the model at 0,6,12,and 18 hours Greenwich), Lee comes back telling me he keeps getting the wrong location. I told him I'd see him after the forecast issue time, then I had a look; he'd flipped lat for long in one line of the code. After fixing it and testing with a few points he went home happy and I had 3 hours left in my shift. I went back to the weather office and monitored and adjusted the forecast a little, then left at 7 pm. After getting home I realised I'd forgotten to log my work hours, and I'll have to go back some time this week to do it. However, some good things happened. Overall the forecast worked out for today, especially on the Northeast Coast and in Labrador. Second, when going for coffee I saw some possible photo ops so the next time I went for coffee I took the camera. Then after work I saw some nice clouds behind the MacDonald Bridge (a suspension bridge) and got some images which may or may not work out. It looked really nice in real life, and it was fun trying to get a good exposure, and to shoot without a tripod near sundown. Also, the time change allowed me to be outside before dark after work! This is one of the best things about photography. Whether your shots work or not, you have seen something nice enough to deserve a good shot, and you have paid attention to it and enjoyed it. Also, in trying to get a good composition, you get to see the scene from a good vantage. Finally, as a photographer you are always noticing things that are interesting, funny, attractive, or really beautiful. You aren't worrying about the little things, and you are more in the world. In summary, a typical day forecasting for Newfoundland and Labrador, working with pleasant people who share your disgust with some of the tools that Environment Canada is forced to use this day, and ending with some nice images and scenery. Tomorrow it is back to regular research at Dalhousie. This was added later, and you can see the wonderful woodwork and painting on the totally wooden pillars. A music group was practicing for a performance at the evening service. In retrospect I would have liked the ball cap to be missing. 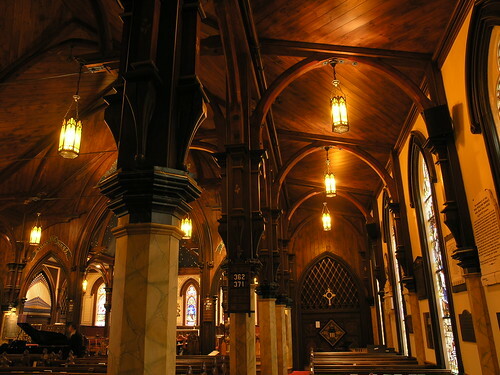 The combination of rich wood tones and a gothic design creates a beauty that made my jaw drop when I went inside. It is totally different from the black and white exterior. 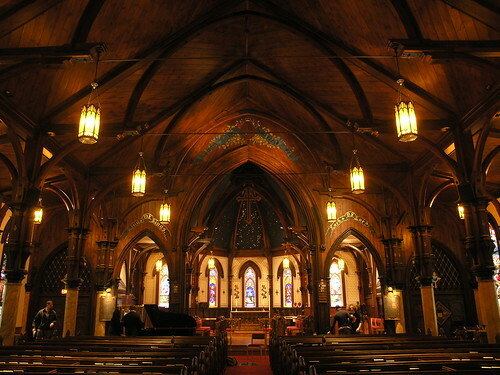 Some people compare the pillars and arches in a Gothic Cathedral to tree trunks and branches in stone. There is something to be said in favour of the same effect in wood.